Want to rent a car for free? 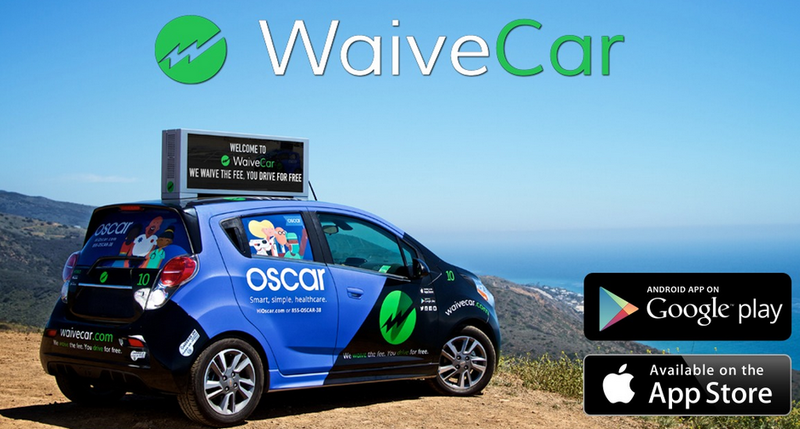 If you are in the Santa Monica area, then check out WaiveCar. The company, launched in January, provides a fleet of Chevy Spark electric cars that are resplendent with advertising on the vehicles. In essence, the cars are mobile billboards for companies. Companies pay to display their ads, and drivers gain free use by taking the cars/ads around town. WaiveCar rents its cars for two hours at no cost. If the rental goes longer, then the price is $5.99/hour. It is simple to use. Download the app, register, and find a car near you. The reservation holds for 15 minutes while you get to the car. The car unlocks when the mobile app detects that the driver is within 10 feet of the car. The driver removes a key from a sensor in the glove box to activate the car and drive away. When the ride is over, a map on the dashboard GPS will show where to drop the car off. The car also monitors the electric charge and reminds the driver about charge level and driving range. Cars are only allowed to go within a 20-mile radius of the company headquarters in Santa Monica. WaiveCar expects to expand in the Los Angeles area and in three new cities. Go ahead – take a drive – it’s free. Discuss different promotional tactics that can be used outdoors. For WaiveCar, break students into teams and have each team build a SWOT analysis grid. Strengths: what is company good at? Opportunities: what is going on in marketplace? Threats: what should company be wary of?